As we get ready to bid 2017 adieu, it’s time to take advantage of festive offers that abound everywhere – from streets to malls, from e-commerce websites to your friendly neighborhood store. Exciting Offers have become the highlight of the Festive Season, providing you with additional benefits on the purchases that you make. From lucrative Cash back offers to big Bonus offers, there are lots to choose from. You may have planned a trip to an exotic location located nearby or may have pledged to indulge in a passion that you’ve long been waiting to partake in! As far as the latter is concerned, this festive season is the right time to start. Get ready to take your passion for Rummy to new levels this New Year! If you happen to be a Rummy lover, then now’s the time to indulge in your passion for Rummy. For a Deposit of Rs. 500 or more anytime from 24th Dec to 1st Jan you get a 20% Bonus up to Rs. 1000. 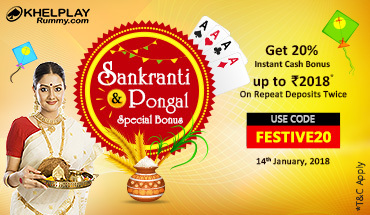 Depositors would be required to use the Code: FESTIVE20 while making the Deposit. And the best part about this Bonus is that it would be given away instantly upon deposit. So, say, you make a deposit of Rs. 500, you get Rs. 100 extra to play Cash Games with. Likewise, if you deposit Rs. 1000, you get Rs. 200 more! When is the Festive Cash Bonanza? The Festive Cash Bonanza starts at 10 AM on 24th Dec and ends at 11 PM on 1st Jan, 2018. How can I use the Bonus? 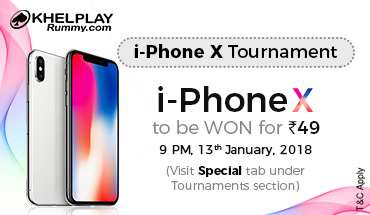 With this Bonus, you can have unlimited fun playing Rummy at KhelPlay Rummy. The 20% Bonus can be used to play all the different Cash Games at KhelPlay Rummy. So, why wait? 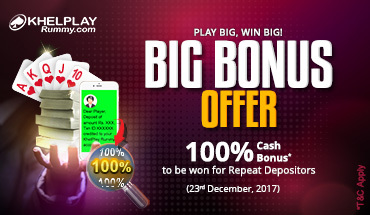 Deposit now to avail the Bonus in Festive Cash Bonanza. For full details of the offer, click here.